Yesterday, I found out Propeller-chip(40pin DIP) is sold from akizuki( Very very famous parts-shop in Japan). This is sold on RadioShack? Can I make directory for user code inside .partition-sys/ directory? Or should I make such a directory inside .partition-usr/ directory? And how does I save file(for example test.f) to SD-card? What size does using max SD-card? 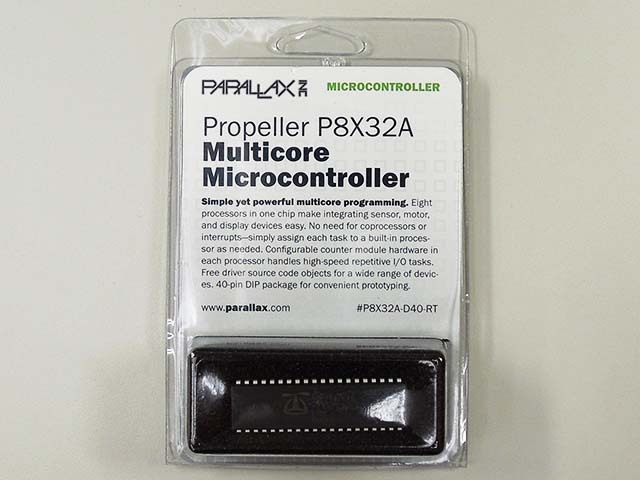 Propeller-chip(40pin DIP) is sold from akizuki( Very very famous parts-shop in Japan). That looks like the same packaging I see at Radio Shack. However, Radio Shack does not list the 40 pin DIP on there web site. They might change they stock from order to order. So, you see that Sal made two SD partions by default. The idea is that PARTION-SYS is where any system related stuff goes. PARTION-USR is were the user stuff goes. A) You can leave PARTION-SYS alone, and put all you stuff in PARTION-USR. This way you won't risk stepping on the system stuff, as your app won't even see it. you can put you APP in PARTION-SYS, and have you app Read and write to PARTION-USR. This way your end-users can does what ever they do, and not worry about stepping on the application software or the system software. Of course, you can do what every you want, even switch between the two partions, or remove one, etc. This is just for organization. Its sometime "better" to put the unchanginf system related stuff in a separate place, and the volitile stuff in a seaparate. place. I would use (A) while I develop, and (B) when the development is done and I want to deploy the finished units. You can do this or something different, please let us know it you find a better way. This was just the first guess as what might be convenient. One difference is there is no fsclear on the SD. We just keep saving the same file name over and over to make new versions. After 1 million times the SD might start to get full, at which time reformat the SD. There should be examples in there but its too early here. The kernel uses any (every?) size SD. I think Sal said he had a 16 or 32 gig card that worked fine as expected. He has not been able to fill a 1 Gig card after continuous logging of multiple records per second for weeks on end (in the "write to the SD until it dies" tests). So we only use the smallest, oldest SD until we can find something that would use a big SD. Have something in mind? I did copy/paste to TeraTerm. fwrite need numblocks_to_allocate on stack. I changed "fwrite test1" to 1 fwrite test1". How does I save file to SD-card? And Can I save file under desired directory? Although I start to read files SD-file-sytem, I can't understand at all because there is many files. "fl" don't need when copy/paste. File"test1" is loaded by "fload test1" on current directry. If I want to save file inside .usr1/ directry, I must move to .usr1/ directry. About Block of "4 fwrite test1"
I think block-number is 1 since test1's size is 60byte. How to setup automatically this number? Although test10's code is overrided, block-number is not overridede. 5) create a file. Allocate the maximum block you will need. Determine this with a experiments and math before the final application. The file size will never change, until you create a new file of the same name with a different size. Old version of files on the SD never go away until the card is reintialized. 8) to write to a file (a logfile for example), the file must exist and be the current file in the current directory. see simple logger for examples. Is there a PropForth Object exchange similar to the Parallax OBEX? I'm not sure if this question should be on the Parallax Forum or not. and eventually complete and tested sets should make it into the extensions directory in the propforth download archive, after they get tested sufficiently. We haven't figured out a way to determine "tested sufficiently" yet. Ideally, they would be added to the test automation suite, and everyone could run the tests to prove that everything works according to requirements and doesn't get broke. Still working on this future tech. In some cases Sal decides it better just to finish the implementation if its too hairy or requires kernel mods or its just beyond my ability. Examples would be VGA (for jupiterACE), caskaz's SD (required kernel changes to do it efficiently), servo and PWM (I didn't figure out to use the counters, so Sal just did it himself). In other cases (for example Loopy's half duplex serial) the request is different from what Sal imagined anyone would ask for (actually happens all the time), and I was unable to figure out a satisfactory solution. In these cases, something may get done different in the next release. So, there are locations to find contributed code, but we cant always guarantee the quality; and there are mechanisms to get internal changes made. The process can be frustratingly slow, and the results a very long time coming. I checked to read block. 0000: 1B 2F 2E 70 61 72 74 69 6F 6E 2D 75 73 72 2F 2E  ./.partion-usr/. 0040: 75 6D 62 65 72 0D 3A 20 73 64 5F 64 75 6D 70 0D  umber. : sd_dump. 00A0: 64 20 20 0D 20 20 20 20 20 20 20 20 20 20 20 20  d  .
0120: 72 79 20 74 6F 20 74 62 75 66 0D 20 20 20 20 20  ry to tbuf. 0130: 34 20 63 6F 67 3E 6D 65 6D 20 20 20 20 20 0D 09  4 cog>mem     ..
0140: 74 62 75 66 20 64 31 36 20 62 6F 75 6E 64 73 0D  tbuf d16 bounds. 0180: 20 41 53 43 49 49 0D 09 73 70 61 63 65 20 0D 20   ASCII..space . 01D0: 20 68 32 45 20 74 68 65 6E 20 65 6D 69 74 0D 09   h2E then emit..
01E0: 6C 6F 6F 70 0D 20 20 20 20 20 63 72 0D 20 20 20  loop. cr. 00C0: 20 20 20 20 20 20 20 20 02 00 01 00 00 B0 3B 00          ......;. 01E0: 20 20 20 20 20 20 20 20 20 20 20 20 73 74 3F 0D              st?. 01F0: 20 20 20 20 20 30 20 64 6F 0D 20 20 20 20 20 20       0 do. I found out strange inside sdfs.f. This forth-code return filename's blocknumber. It seems that these(StartKernel-1.f, StartKernel-2.f, DevKernel.f, SD-files including sdfs.f) are NOT real source codes. I need real source codes. 0000: 1C 2F 2E 70 61 72 74 69 6F 6E 2D 75 73 72 2F 2E  ./.partion-usr/. 0070: 6E 6F 74 20 66 69 6C 65 6E 61 6D 65 2C 20 22 20  not filename, "
0080: 46 49 4C 45 20 4E 4F 54 20 46 4F 55 4E 44 22 0D  FILE NOT FOUND". 0120: 75 6D 62 65 72 0D 20 20 20 20 20 64 75 70 0D 20  umber. dup. 0160: 62 75 66 28 43 6F 67 20 6D 65 6D 6F 72 79 29 0D  buf(Cog memory). 01D0: 20 0D 20 20 20 20 20 64 75 70 20 63 72 20 2E 22   .     dup cr ." There is problem in 2. Sending 'sd_dump_0.3' from TeraTerm's Send File when current directory is '.usr1/' directory. File 'sd_dump1' is NOT saved. File 'sd_dump1' is saved on system directory. If using copy/paste, it can save files to disired directory. But when using 'Send file', it let files to save system directory. Of course, I know Not recomendation for using 'Send file' on PropForth. But I have no experience such a trouble when using 'Send file'. I'm about using 'fl' on SD-card system under investigation. test.f is load to propforth by "Send file" for TeraTerm. test.f is saved on mountsys. File always is saved on mountsys anywhere current-directory. Maybe I think this is caused by speed between 'fl' and SD-card acccess. Anyway, 'fl' cannot use on SD-card system. Uploaded SD_Utility including 'file_dump' and 'blk_dump'. I think these often are not used. If you want to understand propforth's sd-structure, these code is helpfull to you maybe. It seems someone did download SD_utility. Did you try 'file_dump' and 'blk_dump'? Sorry, there is mistake at 5line in Readme_SD_Utility_0.1.txt. Is anybody following along on caskaz's SD investigation? Comments and such would be really helpful. I have done some try and error with the filesystem,and this is working for me. The lines between " " have I copied into the TeraTerm window after a reset of the Propeller. Allways remember the 3 ... at the end and a cariage return, for it to work. You can also type it into the TeraTerm, but then you have 3 char delay, and it is difficult to know where you are. Did you copy/paste lines between " "? Yes I copy/pasted from my notepad into TeraTerm, without the " ". I tried same. I changed block=1. Is the word key? intentionally disconnected in version 5.5. It is in version 4.6.
wait until key press, and return character. if no key pressed , pause execution until key press. I think it was something like key and key? were too close, so key and fkey? we selected as sufficiently distinct. That explains why my old code in version 4.6 does not work anymore. In version 4.6 is key? and fkey?, and I have used key? Does Propforth have a see word? I looked in the documentation and used the words command, but I haven't found anything yet. I need it because I was noodling around and got a word to work, did a saveforth, and now I forgot what I did. It doesn't have see but there is a very good decompiler in the wiki listings I believe written by Peter of Tachyon fame. Can you post a link to that? I can't seem to find it right now. Never mind, I found it is in the download tab. Great, thanks for help me recover from my sloppiness. I got HMC5883L-module(3-axis digital compass). 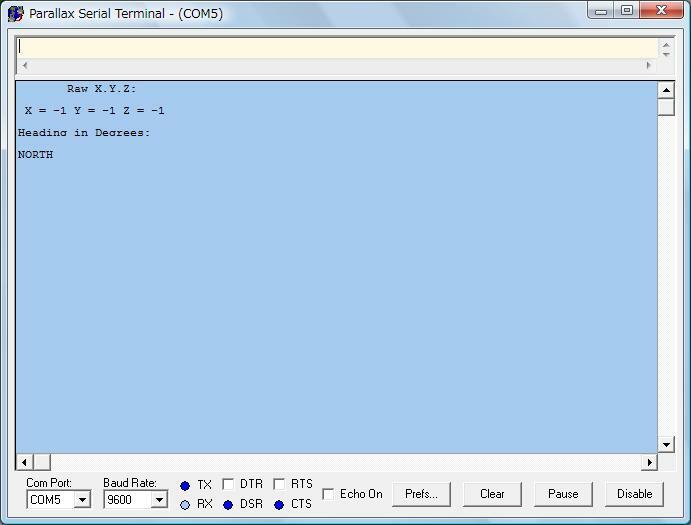 So I think I2C-communication is ok.
You might have to ask on the general or sensors forums. I still haven't gotten to use this yet.